Salmon farming has traditionally been done in open net pens in countries with sheltered coastline and optimal climate conditions. Because of problems with disease in the net pens, both production costs and market price of farmed salmon has risen dramatically in recent years. Several attempts have previously been made to grow salmon in land based systems, without success. Niri’s integrated water treatment system has resolved the issues from the earlier attempts, high investment costs and high pumping costs. 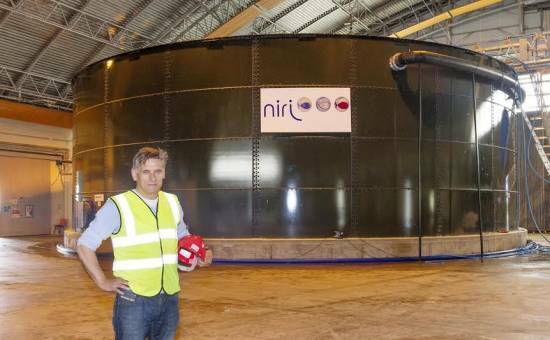 Niri simply cleanse and recycle the water without pumping it out of the tank rearing system. Hence Niri’s system is easy to build and operate, producing large quantities of fish of the same size. Niri Scotland’s Chief Executive Officer Arve Gravdal said: “Our system is unique. What we have done in Scotland is to prove that our technology works and that we now can build industrial scale salmon farms anywhere in the world.” Veterinary reports from Niri’s earlier test units state that the fish is of very high quality, like wild fish. A processing plant for consumer ready products can be integrated with the Niri system. A number of useful by-products can thereby be developed. Health supplements, fertilizer, ultra pure oil, ingredients for pet food, as well as fish feed for other species. Niri AS was established in 2008 in Måløy, Norway, with the ambition of commercializing land based salmon farming. In 2008 IRIS (International Research Institute of Stavanger) published a report that proved salmon farmed in a Niri system can be produced at significantly lower costs than in sea cages. The Niri technology has been gradually developed over the past 10 years. Arve Gravdal performed his first trial in 2002 (patent no. 10491593 in the US) in 600 m3 tanks. A small team of engineers and marine biologists, lately in cooperation with Reliant Installations Ltd from UK, have since been developing the technology resulting in the project in Scotland.